On May 23, 2013, a portion of the steel truss structure of the I-5 Skagit River Bridge near Mount Vernon was struck by an over-height truck causing a section of the bridge to collapse. Over 71,000 drivers cross the Skagit River Bridge on a daily basis causing a significant concern for the state and surrounding communities. 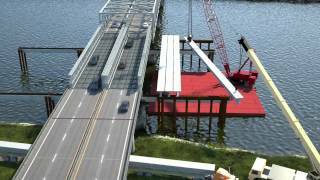 WSDOT and other agencies quickly went into action to replace the span. Atkinson Construction installed an ACRO bridge and traffic was opened to drivers June 19th, 2013. As the temporary bridge was being installed, contractors were submitting proposals to the state for a more permanent solution. Max J. Kuney Company’s proposal was accepted as the best solution. Their plan included the use of Precast/Prestressed 65” Decked Bulb Tee girders. The girders were used to build the new bridge span adjacent to the ACRO bridge. Once the span was complete, the ACRO bridge was removed and the new span was slid into place and secured to the existing piers within a 19 hour duration. The job was completed and I-5 opened to traffic September 15th, 2013, 114 days after the initial incident. Sand Lightweight Concrete: The new super structure weight had to remain within the capacity of the existing piers. CTC developed a sand lightweight concrete mix to reduce the girder weight. At 138 pcf, the concrete density was approximately 25 pcf lighter than standard concrete. Even at this lighter density, CTC was able to achieve a 7.5 ksi release strength and 9.0 ksi 28 day strength. Girder Sag: In order to conform to the road profile of the existing bridge, CTC incorporated a "sag" in the girders to counter the effects of the girder camber. Long Spans: Each girder was 163’ 1-1/2” long. Closure-Pour Channels: Headed rebar extended laterally from the deck of each girder. When the girders were placed side by side the headed rebar interlocked and the closure was poured to secure the girders to one another.